Day of rest. Went to church. We had a fast and testimony meeting. The lesson in Sunday school was on the Word of Wisdom. I taught it. At the end a thought came to me that I shared with the class, and I believe it is worth being mentioned here. I said, to run and not be weary is good, but to know that Joseph Smith was a true prophet is better. The Word of Wisdom is a principle in the LDS religion that teaches us to take good care of our bodies. Part of that is staying away from alcohol, tobacco, coffee, caffeinated tea, and harmful drugs. We also believe in eating a diet rich in fruits, vegetables, and grains, while eating meat in moderation (yes we do, even if you might find it hard to believe if you go to a typical LDS activity). We also believe in a lifestyle that involves going to bed early and arising early (again, might be hard to believe that we do if you look at your typical BYU student schedule, but it is in the Doctrine and Covenants 88, and it was specifically mentioned in the lesson manual), as well as regular exercise. Among the blessings promised for obedience to the Word of Wisdom is "run and not be weary" and "treasures of knowledge, even hidden treasures". In particular, one of those hidden treasures is to be able to recognize and see plainly that the Lord has called a prophet in the last days, just like he did in the times of the Bible. A.M. Total of 12. 2 with Jenny in 15:56, 8 alone in 57:59, 2 more with Benjamin in 15:02, last mile in 6:26. P.M. 0.5 with Jacob, Joseph, and Benjamin. A.M. Tempo run with Daniel. Did 2.5 in 13:41. Splits were 83, 82, 82, 81 (5:28), 82, 83, 83, 84 (5:32, 11:00), 81, 80. Daniel had not gotten enough sleep, so he was really struggling. He made it to about 0.75 with me, then coasted in with 14:17. Total of 12 miles including 2 with Benjamin. Jenny and Julia ran 2. Then Jenny took Jacob for 0.5. P.M. Benjamin ran 0.5 with Joseph. A.M. 10 in 1:13:43. Jenny and Julia ran 2, including 0.5 with Jacob. P.M. Benjamin ran 0.5 with Joseph, then 2.1 with me rollerblading alongside in 16:11 in the rain. A.M. Ran with Daniel, and we found Mike Taylor on the trail and ran with him. Mike was Jeff McClellan's teammate in high school. Did a mile pickup to feel half marathon pace for Saturday. Did splits of 82, 81, 84 (under the bridge), and then shifted gears and ran 74, total of 5:21. Added 2 with Benjamin. Jenny and Julia ran 2. Jenny took Jacob for 0.5, and Benjamin ran 0.5 with Joseph. A.M. Ran with Mike. Did a 500 in 1:44 (post-VPB), got home with 8.25 on the odometer. Then added 2 with Benjamin in 15:07 with the last mile in 6:19 and the splits of 1:41, 1:37, 1:33, 1:28. I finally got Benjamin to overcome a mental block with this workout where you start at a brisk pace and then keep getting faster with every quarter. Jenny and Julia ran 2. Jenny took Jacob for 0.5. P.M. Took a nap in preparation for the race tomorrow. My new job (I now work for Percona) does allow me to work on the blog as much anymore, so do not be surprised if I am slow to respond sometimes, but I still work from home, and can squeeze in a nap when I really have to. It has been a great blessing to find this job when my main client ran out of money and dropped my consulting services. Benjamin took Joseph for 0.5. I rollerbladed. 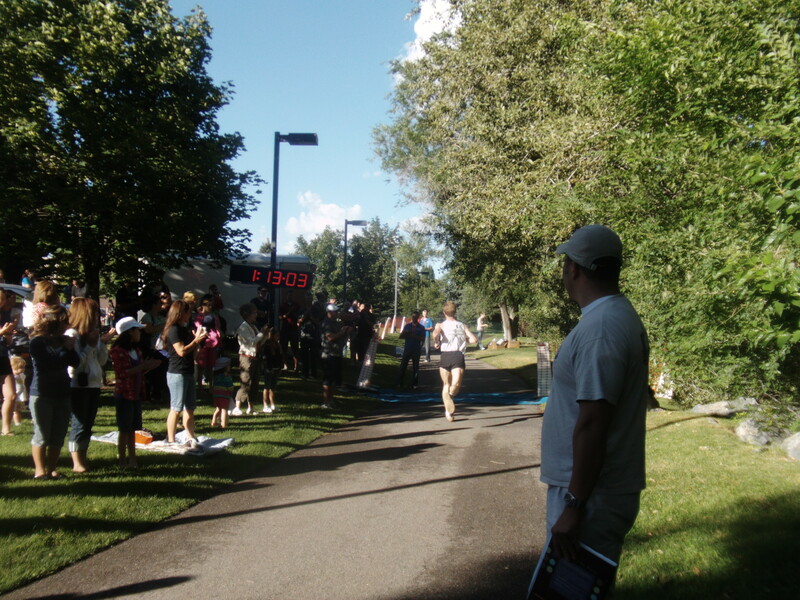 A.M. Provo River Half Marathon, 1:12:03, 1st place. They say mice can play when the cat is away. The cat (Jeff) is in Las Vegas, so the mice got to play. I figured the time on this course is rather meaningless, plus in the absence of a good pack it would not be good anyway, so I ran more or less tactically, more for place than for time. Plus I had never won a race wearing Crocs, and figured who knows, maybe I'll get a sponsorship from it, that would be rather interesting. Not that I cannot afford a pair of foam shoes for $10 once a month, but they might offer more, like paying to travel, who knows. Even if not, winning a fairly large half marathon in Crocs is a good story in and of itself. From the start, Walter went with me. I did not have plans to make an effort to drop him until the course flattened out (around 4 miles), but I noticed he struggled on the mini-uphills, and figured it would make the job easier if I turned up the heat there creating a gap, then he would be softened up by the time we got to the flat part. So I managed to open up about a 10 second gap by mile 2, and from that point on it kept increasing. However, there was much more serious trouble ahead. Around mile 4 Brian Summers appeared out of nowhere. That was disturbing because he had to go pretty fast to catch up. On the positive side he was breathing pretty hard. On the negative side, we were 4 miles into the race and he was still alive. I let Brian pass me and sat behind him. We were on the trail with the triangle marks. The pace on the downhill according to Curt's marks was a steady 5:07, and I believe it could have well been right. On the trail it fluctuated between 5:20 and 5:40 according to the marks. I did not want it to be 5:40 as it would give whoever was chasing a chance to catch up. So when Brian slowed down I would make a feeble attempt to pass him. Feeble so that I would not waste energy and so he would believe he could hold me off. I noticed he likes to lead. That is OK because I like to draft. But I want the pace fast. So I communicated to him that I wanted the pace to be faster by attempting to pass him. When we turned the corner to start the climb up the old highway I saw more trouble. Justin Park closing on us. That is trouble because he came out of nowhere as well. Not surprising with our erratic pace, though. I made an effort to pass Brian up on the hill to keep the pace fast a couple of times to get away from Justin. He responded. I was glad he did because if he had not I would have had to run uphill into a headwind alone. When we got to the end of the hill and turned around, I was quite well rested, about as well rested as I could be after 7.5 miles, and turned up the heat. I was expecting Brian to respond and live to mile 10, and then I hoped to win the battle off fuel knowing that he blew up in a marathon badly a couple of months ago, and would likely be soft after 10 miles. But he did not go, he was too worn out from running uphill covering me from the wind. In about a mile I gapped Brian by about 20 seconds, and Justin had not caught up to him, so I figured as long as I kept my quarters not slower than 84 (5:36 pace) I would be safe. I tried to motivate myself to run a more honest race and go faster, but it was difficult. I was running sort of scared, but not as scared as I should have been. Sometimes too much knowledge is not good. I knew the limits of my competition, and it was not good for my pace. I got to the finish without problems. Sarah was kind enough to get up early in the morning in spite of being only a couple of weeks away from giving birth and be there to take a picture. I will post it when I get around to transferring it from the camera. Brian came it around 1:13:30, Justin was about 10 seconds back, Walter was around 1:14:00. Michelle won the womens with a course record in 1:17:38 (I think). Saw Rob finish, he got 1:19:04 or about. That is a PR in the half for him. Went back and paced Stuart (the lost sheep), and then ran some more miles to make it 20 for the morning. Update: the picture is here. Note that the clock shows the wrong time, it was started 1 minute before the actual start of the race. P.M. 2 with Benjamin in 16:47. 0.5 with Jacob, Joseph, and Benjamin. Jacob and I hung back with 4:55, Benjamin and Joseph ran 4:26. Jenny and Julia ran 2 in the AM. Day of rest. Went to church. The talks in the Sacrament meeting were on responding to the guidance of the Holy Ghost. The lesson in Sunday School was on charity. The lesson in the Elders Quorum was on the organization of the Priesthood. A.M. Ran with Mike, and then with Benjamin (2 miles). Total of 12 miles. Did a mile pickup. Jenny and Julia ran 2. A.M. Ran with Mike and Daniel. We did 3x1200 on the trail progressively increasing the pace. First one down a small grade in 4:03.7 (84-80-79), then back in 4:00.6 (82 - 79 - 79), then back down in 3:49.9 (79 - 76 - 74). Added another 2 with Benjamin, and 0.5 with Jacob. Total of 12.5. Jenny and Julia ran 2. A.M. Ran with Mike. Added more with Benjamin, 2 miles in 15:04 with the last mile in 6:12 (1:40 - 1:33 - 1:32 - 1:27). Did a couple of pickups during the run.. Jenny and Julia ran 2. I ran 0.5 with Jacob also in 4:36. A.M. Ran with Mike, and then with Benjamin. Total of 12 miles. Did a "fat" mile in 5:40. Benjamin ran 2. Jenny and Julia ran 2. P.M. Benjamin took Joseph for 0.5. I rollerbladed. A.M. Ran with Mike and Daniel. We did a quick 1 K in 3:19 (5:20 pace), otherwise ran easy. Ended up with 10.2. Then added 2 with Benjamin in 15:55. We did a pickup to catch a guy on the trail, ran 300 in 1:04 (5:40 pace). Then another pickup at the end. Jenny and Julia ran 2. I ran 0.35 with Julia. P.M. Benjamin took Joseph for 0.5. I rollerbladed. Jacob still had a fever. A.M. Long run with Mike and Daniel. To Bridal Veil and back. Total of 20.4 in 2:10:48. Mike met me at my house. Daniel met us on the trail. Started at a slow pace, then quickly progressed to about 7:10. Then Daniel pushed it a bit and we started doing 6:40s, which was decent for headwind and uphill in the canyon. Then we got to the turnaround point, which is about 0.2 from the actual waterfall, but Daniel is from South Carolina, so he wanted to see the waterfall. We ran extra 0.2, then turned around, ran another 0.2, and then turned on the sirens and the flashing lights. The plan was 5:50 for 10 miles for me, and to fatigue for Mike and Daniel. Not the ultimate fatigue, because they still had to get home after that, just as soon as they felt the threat of not being able to make it home at 8:00 pace. Mike made it a little past the mile, Daniel fell back around 2 miles into the tempo. The pace was actually a bit quicker, around 5:45. There is a big difference between doing that pace fresh, and doing it after a 10 mile "warm-up". I felt good, the form started feeling very smooth around 16 miles into the run. I wonder if my recent SI joint stretches have been helping. The pace got up to 5:40, but not for long, I slowed down back to around 5:45 on good stretches, and as slow as 6:00 on the turns/bridges. But I was able to shift gears in the last mile and run in 5:39. Total time for the last 10 was 57:28, 5:45 average. P.M. 2 with Benjamin in 15:43. He made me work in the last quarter - we ran it in 86. I really did not feel like it in street clothes and warm weather, and having run 20 earlier with the last 10 hard, but I was not going to get dropped. 0.5 with Benjamin and Joseph in 4:24. Benjamin took Jacob for 0.5 in 5:08 earlier. Day of rest. Went to church. The talks in Sacrament addressed a variety of topics, but one thing that stood out to me was the idea that if we had it easy in this life we would not be comfortable in the Kingdom of God in the company of Paul, Peter, Moses, Isaiah, Jeremiah, and other prophets who had to suffer adversity in this life. That goes along well with Christ's answer to a request by the mother of two apostles who wanted them to sit with him in Heaven: "Ye shall drink indeed of my cup, and be baptized with the baptism that I am baptized with: but to sit on my right hand, and on my left, is not mine to give, but it shall be given to them for whom it is prepared of my Father." (Matthew 20:23). The lesson in Sunday School was on honesty. The lesson in the Elder's Quorum was on covenants. A.M. 12 miles, some with Daniel and Mike, the last 2 with Benjamin. 0.5 with Jacob in addition in 4:37. Jenny and Julia ran 2. P.M. Benjamin took Joseph for 0.5. A.M. Ran with Mike and Patrick Rotich. Learned how to say "bee" in Swahili - nyuki. Well it was really a wasp, actually, three of them, but I had a hard time explaining the difference between a wasp and a bee to Patrick in English, so nyuki is all we got. I stopped for a VPB, and ended up in a wasps' nest. But it did help me catch up quicker! The bites did not hurt too bad while I was running, but once I stopped they swelled and itched. Added 2 with Benjamin, and 0.5 with Jacob. A.M. Did some downhill repeats with Patrick and Mike by the Provo Temple. 5x0.4 . The first one at around 5:00 pace, the rest at around 4:35. Patrick did them at around 4:05 pace. Mike was sometimes with me, sometimes a few seconds behind. Total of 11.5 for the run or so. Added 2 more with Benjamin, and 0.5 with Jacob. Jenny ran 2, Julia ran 0.7, was not feeling well, then finished out 2 with Benjamin. A.M. The plan today was an easy run with maybe 1 fat mile. Ran with Mike, Thomas, and Patrick. Patrick gradually kept speeding up. We dropped Thomas quickly. Then it was time for Mike to turn around. I figured I'd go with Patrick for a while as I wanted to do some tempo miles. He sped up to sub 6:00, kept it there, eased off a bit to discuss his Garmin, then sped back up again. Once I got about 6 miles of tempo running in I asked him to back off. He slowed down from 5:50 to maybe 6:15. I was not too far away from the house, and could have done 5:50 all the way, but I did not want to overload the nervous system. Total time for 12.5 was 1:19:44. Added 2 more with Benjamin with the last 0.5 in 2:59. 0.5 with Jacob in 4:42. A.M. Ran with Patrick, Mike, Thomas and Kevin. Ended up with 10 miles. There was a post VPB pick-up, timed a quarter in 83. Added 2 more with Benjamin in 15:46. We had some dog adventures. A dog started chasing us. We sped up and dropped it. It gave up after a few seconds, it was a small wimpy dog. Then Benjamin asked me how fast I thought the pace was when we dropped the dog. I said about 4:50, but if you really want to know run that pace for 100 meters and I'll time it. We did. It was 18.0, 4:48 pace. Then I told him some people run 26 miles at that pace. We did a little pickup at the end as well. Added another 0.5 with Jacob in 4:36. P.M. Benjamin took Joseph for 0.5 in 4:34. A.M. Ran with Mike. Long run. Since we had run some tempo miles on Thursday, this long run was on the easy side. Yes, I know, easy 20 sounds rather funny. But today was the day of buying a lunch for 7 people for $3. Meaning that we get a good stimulus with relatively minimal work. So we ran to Bridal Veil and back with some pickups. About 3 miles into it a mile in 5:46 on a mixed terrain, probably a small net uphill. Then around 7 miles into it another mile uphill in 5:46 again. I asked Mike how he was feeling, he said the pace felt very sustainable. So I suggested we do 1.25 pickups instead of just 1 mile to discover problems better. On the way back about 10.5 into the run we hit 1.25 downhill in 6:34 (5:15 pace). That was a great improvement for Mike as he got dropped last week after a mile at 5:45 pace on the same stretch. Then another test. Around 16 miles into the run another 1.25 on a mixed terrain with probably a slight net downhill. Mike struggled but managed 7:16 (5:48 pace). And finally one more. With 1.5 from my house we started going fast again. Mixed terrain, turns, bridges, slight downhill. Quarters of 84, and 85. Mike turned to go home shortly after that, I kept going fast. Ended up with 8:21 for the last 1.5 (5:34 pace), and 2:22:06 for 20. Remembered a Russian movie we watched recently where there was a robot that looked like a 13-year-old boy and could run 300 kilometers per hour. I thought, well, I am struggling to do 17, but at least I am real and live, while he is a robot and just in a movie. P.M. 2 with Benjamin including 600 in 2:14. 0.5 with Jacob, Joseph, and Benjamin. Jenny and Julia ran 2 in the morning. Sarah gave birth to Stephen Alexander Pachev at 12:20 AM at our home. At around 11:10 the labor was not progressing as fast as we wanted to do, so her midwife gave her some homeopathic medicine to get it going and told her to go for a walk to put some pressure on the cervix. Sarah decided to go for a short run instead. She started off at around 8:00 pace. I was not expecting that and had to shift gears to keep up. She slowed down to a more reasonable pace for a woman in labor dilated to a 7 after about 40 meters, but it was still quick. After about 100 meters she decided it was good enough and we walked. She ran some more at the end of the first lap around the block. The combination of the medicine and the cervical pressure from a quick run got things going fast. After two laps of walking around the block (0.7 miles), we got into the house and Stephen was born 15 minutes later. He looked like a runner when he came out - 20 inches, 7lb 4oz, long thin legs. Very nice quiet baby, asks for food politely. Will post the pictures when I get my hands on the camera. Kids stayed at the neighbor's house, and the kids and I were able to make it to church in the morning. The subject of the talks was salvation by grace. The doctrine of salvation is laid out in 2 Nephi 25: "It is by grace that we are saved after all that we can do". The LDS church gets a lot of flack for that, and in all honesty I do not understand why. The nature that God created should teach us about how it works, if only we would learn. Does the harvest a farmer gathers come by grace or by works? Sure it comes by grace. The soil, water, sun, and seeds are provided by God's grace. So is the inherent ability of the seed to grow. But that grace is wasted when the work to plant, grow, and harvest is not performed. Thus by failing to work we waste the grace. So it is with salvation. If we do not keep the commandments we waste the grace of Christ and make a mock of His Atonement. If we do, we gather the harvest that was grown through His grace. A.M. Ran with Patrick, Mike, and Thomas. Easy run, total of 8 for me. Added 2 more with Jenny and Julia in 15:56, 2 with Benjamin in 15:53 with a 700 pickup in 2:29, and 0.5 with Jacob in 4:30. P.M. Benjamin took Joseph for 0.5 in 4:13. 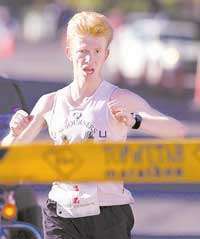 A.M. Patrick was doing a tempo run - 5 miles at 5:00 pace. I figured it would be good for me to run some portions of it. So I did the first mile in 4:58 (71, 75, 76,76) and last 0.5 in 2:30. Mike did portions of that. Patrick missed the turnaround and ended up with 25:58 for some distance that was longer than 5 miles. The initial 4:44 pace of the mile was something my body did not like. I felt it for the rest of the mile. However, the closing 0.5 was much more manageable because it was evenly paced. At least I was happy that I could start with a 71 quarter and hang on. And I was surprised at how easy that 0.5 felt. I wondered if we were off pace during the first quarter. Ran a total of 10, then 2 more with Benjamin, Jenny and Julia. Benjamin did 15:51, Julia 16:47, Jenny around 16:20. 0.5 with Jacob in 4:29. A.M. Ran with Mike, Patrick, and Thomas. Total of 10 miles. Then 2 more with Benjamin, Jenny, and Julia. 0.5 with Jacob. A.M. Ran with Mike. We did a 400 in 70.4 and 600 in 1:45.1. Total of 10. Then 2 with Benjamin. We did some pickups. Jenny and Julia ran 2. I ran 0.5 more with Jacob. A.M. Ran 10 with Patrick, Mike, and Thomas. We did a 100 sprint to measure Thomas' all out speed. It was 15.4. It is probably more than that, as it was mid-run and on the trail. But even that is good enough for a 2:40 marathon if the endurance is there. Ran 2 with Benjamin, Jenny, and Julia. 0.5 more with Jacob. A.M. 20 miles, most if it with Mike, in 2:23:42 to Bridal Veil and back. Did pickups. 1 mile in 5:35 on a slight net up, 2 uphill into a headwind in 11:51, 2 downhill with tailwind in 10:58, 1 on a slight downhill in 5:27, and then I ran the last 1.5 in 8:26 with the last mile in 5:34. Benjamin, Jenny, and Julia ran 2. Jenny took Jacob for 0.5. Day of rest. Went to church. Sarah made it as well. So for the first time we went to church as a family of 7 children all there. The talks were on being prepared. The topic keeps repeating, and for a good reason. The lesson in Sunday school was on missionary work. It was the fifth Sunday, so instead of the Elder's Quorum and Relief Society we had a combined meeting. The topic was following the Holy Ghost. A.M. 10 with Mike, Patrick, and Thomas. Did 1000 in 3:21. 2 with Benjamin, we did pickups - 200 in 36.1, 200 in 37.4, and 400 in 89. Jenny and Julia ran 2, including 0.7 with Jacob. A.M. 10 miles, some of it with Mike. 2 more with Benjamin. 0.5 with Jacob. P.M> Benjamin took Joseph for 0.5.